Got all of these from the San Jose Restore for free. Of about eight of them, only six worked. The Econowatt has a noticeable yellow tinge to it. Left to Right: July 2014, September 2009, July 2014, September 2009, October 2001, July 2014, July 2014. Nice that they gave them to you for free. I got 14 Sylvania F15T8/CWs for 6 cents each! 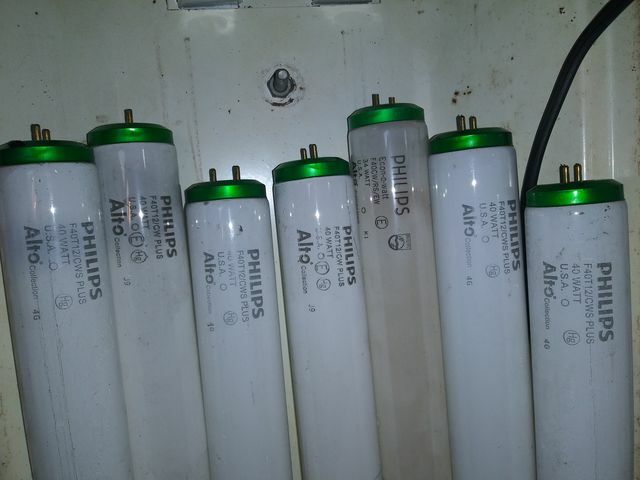 I also saw a box of Philips F40WW/RS/EW made in December 2001 yesterday. While i do like the etch on the Econowatt tube, i really don't like the color and i don't have any F40T12 light fixtures in use that can safely run 34w lamps. Old lighting is, and will always be, the best lighting.